The way we do business and communicate is changing rapidly. Mobility is expected, customer expectations have soared and productivity is essential. The SL2100 galvanises your team – creating a positive customer experience that generates repeat business. With VoIP capabilities built right in, the SL2100 puts Unified Communications (UC) within reach of small businesses, yet still provides superior support for traditional telephony; ensuring total flexibility for every deployment. Your business can’t afford downtime, nor can your communications. The SL2100 provides a reliable ‘always on’ solution. Designed to minimise maintenance and built with minimal hardware & licences; you have little to worry about. Powerful communications with a small price tag the SL2100 allows you to only pay for what you need, without recurring licensing costs. Single number reach, smartphone apps, built-in web based conferencing and unified messaging keeps colleagues and customers up-to-date and connected. Intuitive applications and features your whole team can easily use – enabling them to be more productive. Built in apps like InGuard can be configured to help protect your business from malicious toll fraud attacks. The SL2100 is built to make your business better; it will improve the way your entire team works. Running a small business means you don’t have time to manage your technology – you want it to just work. NEC understands this and has built a number of key business applications right into the SL2100 so you don’t need expensive servers and additional hardware. In today’s working environment, employees are spread across different locations. InUC is a web based Unified Communications solution allowing staff to see if others are available to talk or are currently on the phone. From the web page, employees can click to dial or send instant messages – they also have total control over their phones and communication history. It’s built to grow with your business, supporting from 1 to 100+ users. InUC also offers the ability for your employees to hold engaging video conferencing, collaboration and document sharing sessions with other employees or people outside your organisation, like your customers and business partners. Utilising WebRTC (Real-Time Communications), InUC provides highly cost-effective video and collaboration working seamlessly within your IT environment. InGuard is an effective, low cost solution to help protect a business against the rise of toll fraud attacks. Toll fraud is a fraudulent attempt by a hacker to gain unlawful remote access to a phone system. Attacks are often highly organised from an automated server and once accessed, fraudulent calls are connected and over a period of time, can run up call charges of potentially thousands. Typically, these occur out of office hours and are usually not discovered until it is too late. You want to answer every call to your business, but sometimes that is not possible. The SL2100’s inbuilt Unified Messaging allows you to present callers a self-assist menu allowing them to direct their own call to the right department. Mobility allows your staff to answer those calls in the office or on the road. Sometimes you will however miss a call. Callers are prompted to leave a voice message. This message can then be delivered to you via email so you can still get the message even if you are not in the office. Here are some ways that the SL2100 can save your business money. More features built-in – that means less licenses, less hardware and less extras to pay for. The SL2100 also grows with your business making incremental upgrades cost-effective and scalable. InApps portfolio – InUC and InGuard are already built in, no extra hardware is required so you can simply activate them with licensing. Cloud? – premise-based as opposed to a hosted solution; maintain total control and enjoy the flexibility of your own dedicated solution configured for your specific needs. BYOD – both InUC & ST400 apps enable you to use your existing smartphone or tablet. InGuard toll fraud defence – gain protection against potentially huge company costs. Hot-desking – mobile teams e.g. field sales, don’t require a handset each – share hardware costs. Low IT maintenance requirements – keep IT costs down with a maintenance free, hassle-free system. And as a truly reliable solution – save on downtime costs and potential lost business. Built-in conferencing and collaboration – save travel costs with easy to use conferencing. 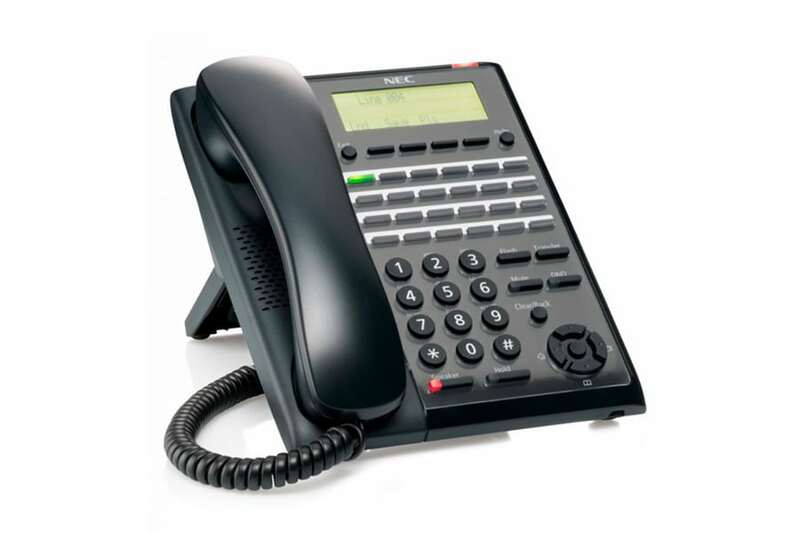 In the office users get access to wide range of high quality NEC handsets. These handsets are designed to any and all business niches or personalisation requirements. There is an NEC phone to meet any requirement, from traditional phones to IP phones, from 12 lines up to 32 lines (self labelling) – the choice is yours. NEC’s desktop telephone interfaces are designed to improve the overall user experience, while remaining intuitive – no extensive training is needed. Missed calls and unread voicemail counts are always visible so you can stay on top of your communications. View the SL2100 interactive user guide. Users can enjoy a complete phone user experience from their home office and enjoy greater working flexibility. Individual and business benefits include the cost and time savings of travel and even the associated costs of workspace. Softphone provide access to system features from the home, e.g. company directory, call transfer and more. Use your existing smartphone as a system extension complete with call control. Save on mobile phone call costs and remain reachable via your desk phone number. The ST400 series app simply connects to the SL2100 via Wi-Fi or across your mobile data network (3G/4G). If the smartphone is not connected due to lack of network, the SL2100 can provide roaming by routing calls to your mobile number.